I enjoyed compiling my Oslo Coffee Shop Hop so much that I decided to extend this concept to Stockholm. The vibe of Stockholm’s coffee shop culture clearly coincides with the overall character of the city. There exists a certain gleam of elegance to cafes, even the dingier ones (if one can label them AS such) – and for me, this made today’s experience somewhat intimidating. Now that I’ve been to Oslo and can compare even on a small level, Stockholm’s air is less casual and more fanciful, a ballgown with silken gloves to Oslo’s swingy black cocktail dress. It’s perfect for the focused shopper and the serious seeker of rich platters, or those with a little Elf in them. For the hobbit, it is perhaps akin to weaving through Gondor. The hobbit may feel inclined to duck a little more or revert to his art of creeping quietly and trying to keep to the shadows. A certain type of hobbit could be tempted to use a magic ring. Nevertheless, the trio of nooks into which I ducked were quite successful in their offerings. Though they were not the three I first intended to seek, all offered fare worthy of mention. Interestingly, each presented a differing interior feel, as if they catered best to three separate crowds. But, I’ll let you decide for yourself, and let me know: which of the three appeals most to you? 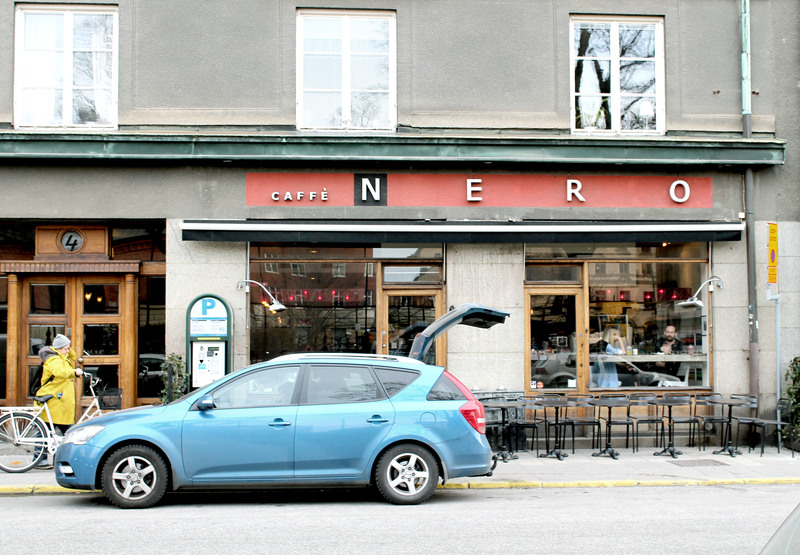 Nero is considered by many to have the best coffee in the Vasagatan realm. It lies about a thirty minute walk from Centralstationen, and the owners also run a restaurant (Buco Nero) which is equally well-loved. The cafe is quite small and appealing to the minimalist in me, with pleasing black and white photographs on the wall of people and coffee-related scenes and magazines for customers’ use spread on a wide windowsill. 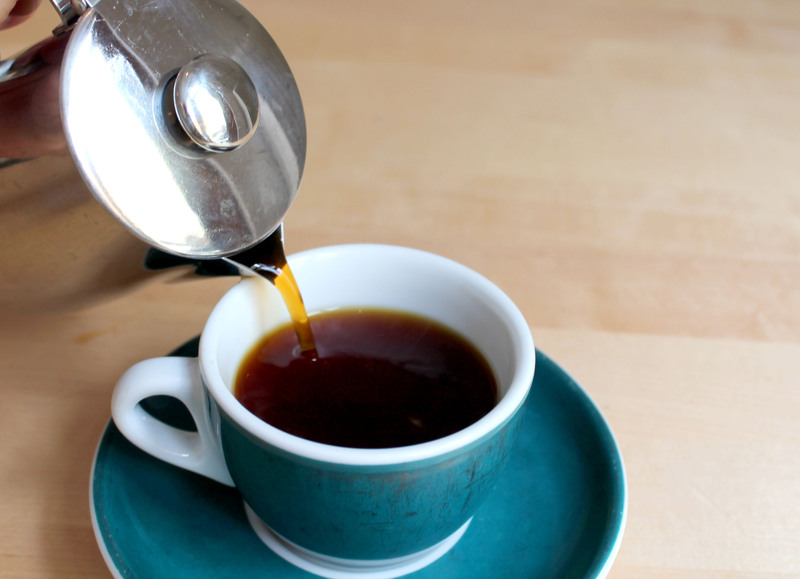 Nero specializes in Italian-style coffee, so one expects it to be excellent – and it is. I ordered a soy cappuccino and it went down impeccably. 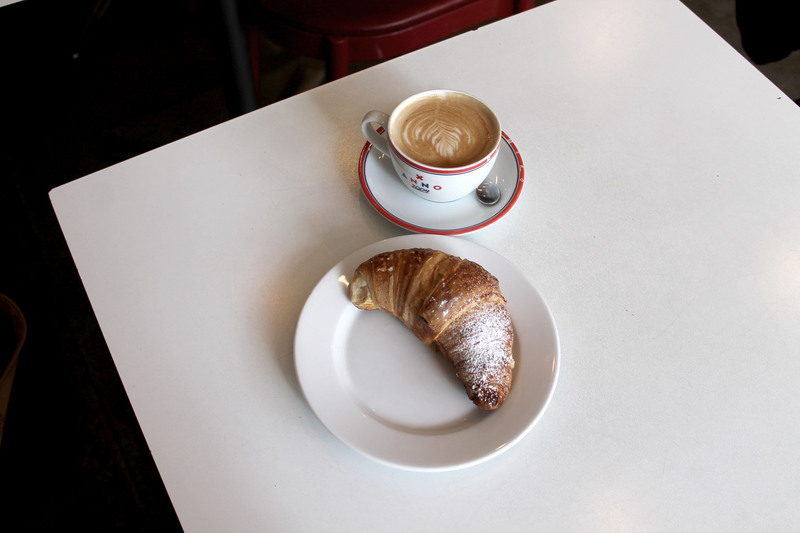 They sell a variety of small pastries, including three types of croissant: chocolate, regular, and apricot. I opted for apricot, as I’ve never heard of that flavor before in a croissant, and I was not disappointed. They also offer sandwiches, jars of yogurt and granola, and colorful juices. The bathroom is worth mentioning too. The entry is a heavy sliding door, leading into a dark labyrinth with soft light and a strangely vivid orange sinkbowl. 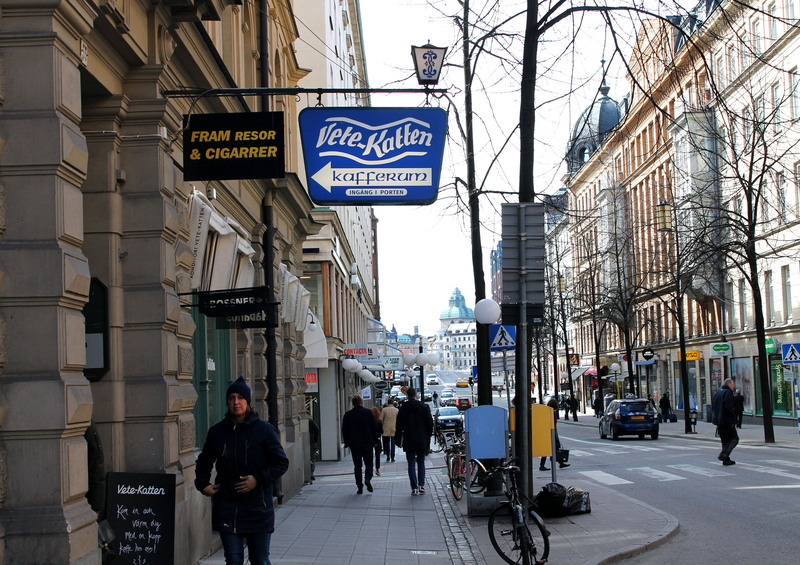 Södermalm is a haven for trendy hipster-types, and I certainly observed such a crowd chattering at the tables and taking advantage of the free internet in Drop. I could not help but grin when I realized that drop was a highly appropriate name considering their use of the drip method for their coffees, which they roast themselves within the same building and one can purchase in-shop if a brew appeals. I opted for a Brazilian bean from Säo Judas and was presented with a bold, nutty, chocolate-y concoction which I happily gulped black. 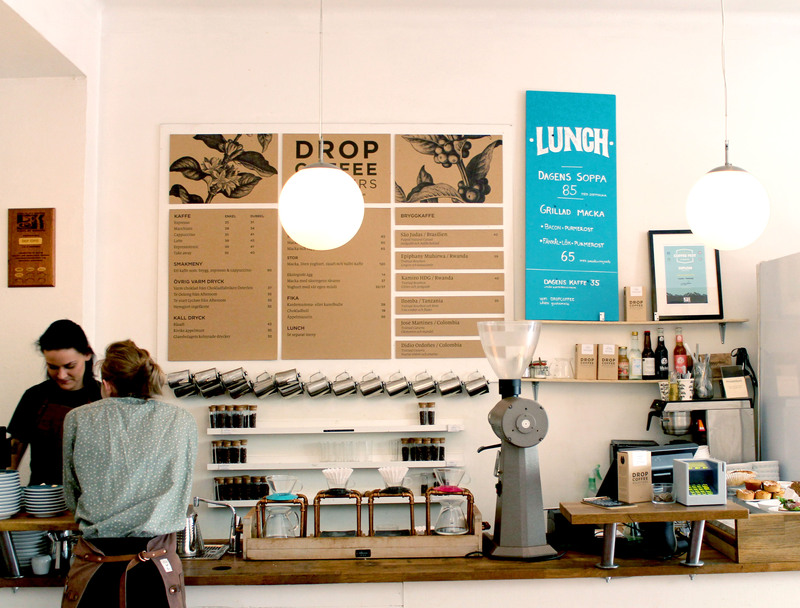 Drop offers a daily lunch special of a soup – which is always vegetarian – or a choice between two or so sandwiches. 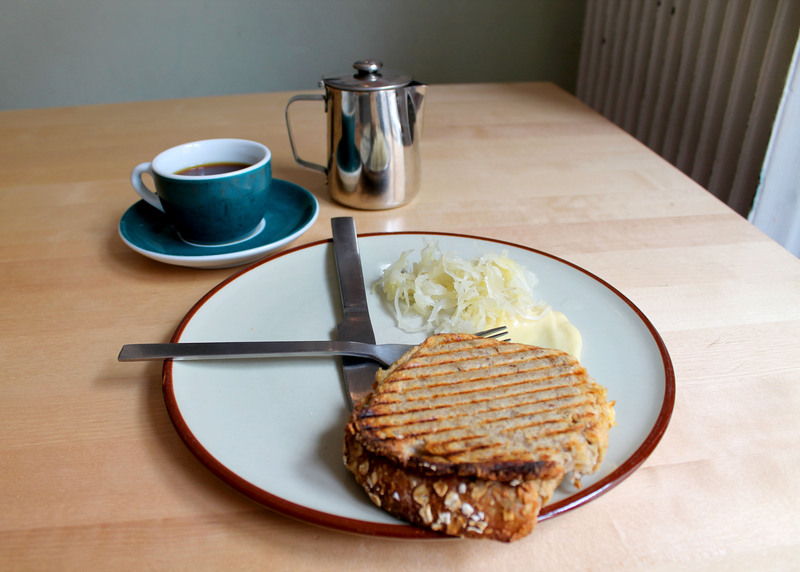 I munched on a horseradish-heated fennel and cheese toast with a side of sauerkraut and a pool of mystery sauce. An odd, but pleasant combination. Apparently they are well-known for offering interesting sandwich options. Admittedly, I wasn’t quite satisfied with the service. Perhaps it was a result of language barrier and discomfort on the barista’s end when speaking English. Reviewers on Yelp often praise the attentiveness and character of the workers, so enter with an open mind – your day at Drop may be entirely positive. Vete-Katten is located on Kungsgatan, and one might say that it is a king amongst konditori.The halls smell of spice and age-old tradition, and one feels lured through the doors by its antique furnishings and dim-lit dining rooms fully packed with well-dressed and hungry customers. Vete-Katten specializes in prim, dainty pastries, especially cinnamon buns and selmor and its huge hunks of princess cake – a Swedish specialty layered with raspberries, cream, vanilla, and marzipan – but also offers tempting a tempting weekly lunch menu brimming with sandwiches, soups, and baked potatoes. 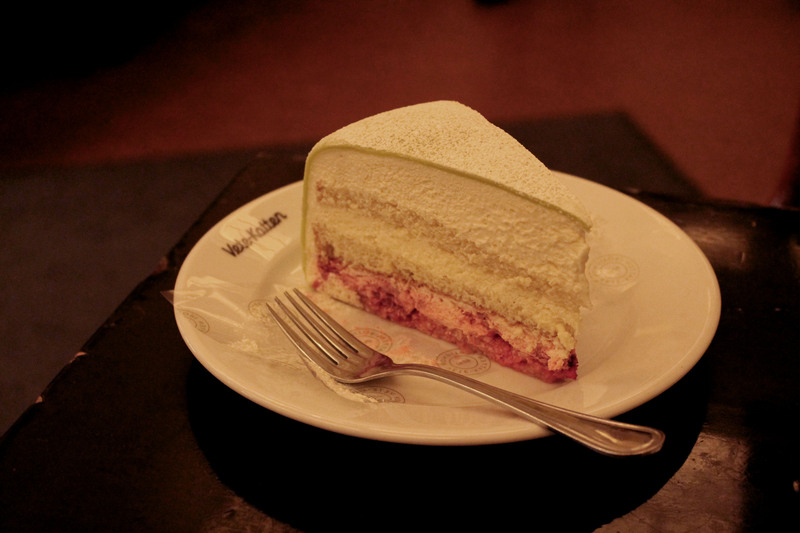 While I’d rather enjoy fika in a spot warmed by natural light, the princess cake made up for the lack of sun. Do you like cafes with wide windows and more sunlight or a darker, cozier environment? Are you a hobbit or an elf? Do you like sauerkraut? Maybe it’s the German in me, but I quite enjoy it. Pingback: Not My Town | VENTURING EAST. Oh my, this makes me want to go and explore all the cafes in my new area! From what you said, I think Caffe Nero would be my favourite 🙂 I’m a pretty standard ‘flat white’ type of person, so it’s usually milk and no sugar, with an occasional extra shot if I’m feeling especially tired. At home I’m a milk, no sugar person as well. I definitely look for cafes with lots and lots of windows. I’m an elf, so I like the sunlight a lot more! I’ve never had sauerkraut before and I don’t reaaaally know if I want to either. Haha. I’ve heard some horror stories!